ALPS Big Bear Pack can be used as a fanny pack, day pack, or both! The fanny pack has a large extendable day pack that gives you an additional 1,900 cubic inches of space on demand! If you’re going on a short trek and only need the capacity of the fanny pack, the expandable day pack section can stow away. The fanny pack has a large main compartment, 2 side pockets, and a front pocket, giving you plenty of space to organize your gear. The Big Bear comes with a padded removable waist belt that has an easy access pocket to keep your smaller items handy. Get yours in Brushed Realtree Edge fabric. With so many options and uses, the Big Bear is sure to quickly become your favorite pack! 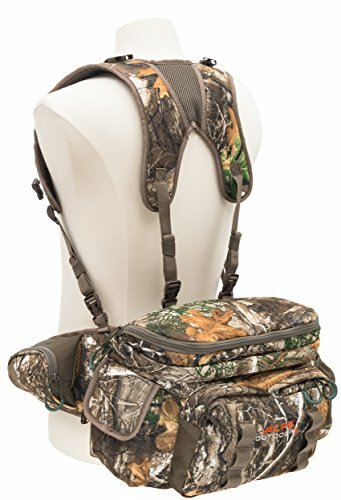 2 packs in 1: Adjustable shoulder harness; Big Bear is compatible with Little Bear optional harness pockets (not included).